You will need an existing Motorweb Account to access information from Motorweb. To acquire an account you can sign up online here or contact Motorweb on 0800 668 679. If you've already completed a VIR or Motor check for a vehicle on your Motorweb account, Motorcentral can connect directly to your Motorweb account and retrieve information about that vehicle, saving you the need to manually enter that information. 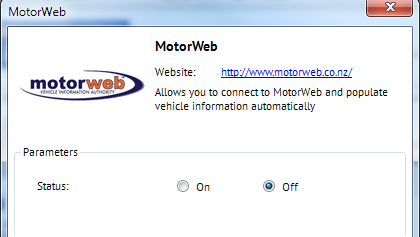 To verify the Motorweb connector has been enabled correctly, open any vehicle and in the menu bar under Quick Entry should now appear two Motorweb options. For more information on how to use the Motorweb connector click here.